Abstract—The integrative activity of the brain is particularly related to the telencephalic level of CNS. Drugs affecting learning and memory usually interfere with the reticular or limbic system, and are either stimulants or sedatives. In contrast, Piracetam (U C B 6215) is an atoxic compound which, up to dosages such as g/kg, does not interfere with autonomic functions, general behavior, level of wakefulness, the limbic system, etc. Yet, in dosages such as mg/kg it improves several learning and memory abilities, protects against experimental amnesic agents, facilitates EEG recovery after severe hypoxia and also facilitates interhemi-spheric transfer (transcallosal evoked potential and learned behavior). Discussion is made on the basis of the particular neuropharmacology as well as on the available biochemical and human clinical correlations to emphasize the selectivity of this compound on telencephalic integrative mechanisms. Piracetam is presented as the first-comer of a new psychotropic class for which the term nootropic is proposed. The integrative activity of the brain may be considered as the body of mechanisms which, in higher mammals, are related mainly to the telencephalic plasticity (Konorsky, 1967).Learning and memory and integration of a new information in the amnesic background to make appropriate decisions, are some of the most usual aspects of the higher CNS-plasticity.Many drugs were described that interfere with learning and memory (McGaugh and Petrinovich, 1965).Most of them, as emphasized by Roy John (1967), influence only indirectly the integrative activity of the brain by interfering with mechanisms related to attention, perception or motivation. In this short paper, I should like to draw your attention to a new drug, Piracetam.We consider it as the first-comer of a new psychopharmaco-logical class characterized by a direct interference with the higher, telencephalic integrative mechanisms of the brain. Leaving aside the actual chronology in which data were obtained during the nine-year-old study of this drug, out of the complex pharmacology of Piracetam, only the essential will be presented to support the telencephalic hypothesis on the mode of action of this drug. The first, striking pharmacological impression when dealing with Piracetam is that of an inert compound. Indeed, up to dosages such as g/kg, no activities common to conventional drugs were ever seen in several animal species. This is based on about 30 classical psychopharmacological tests such as: behavioural observations (no sedation or tranquilization, no stimulation, no interference with synaptical transmitters, no acute or long-term (toxicity); electro-physiological investigations (no cortical or subcortical EEG changes, no interference with limbic after-discharges, reticular sen-sori or direct arousal threshold, etc. 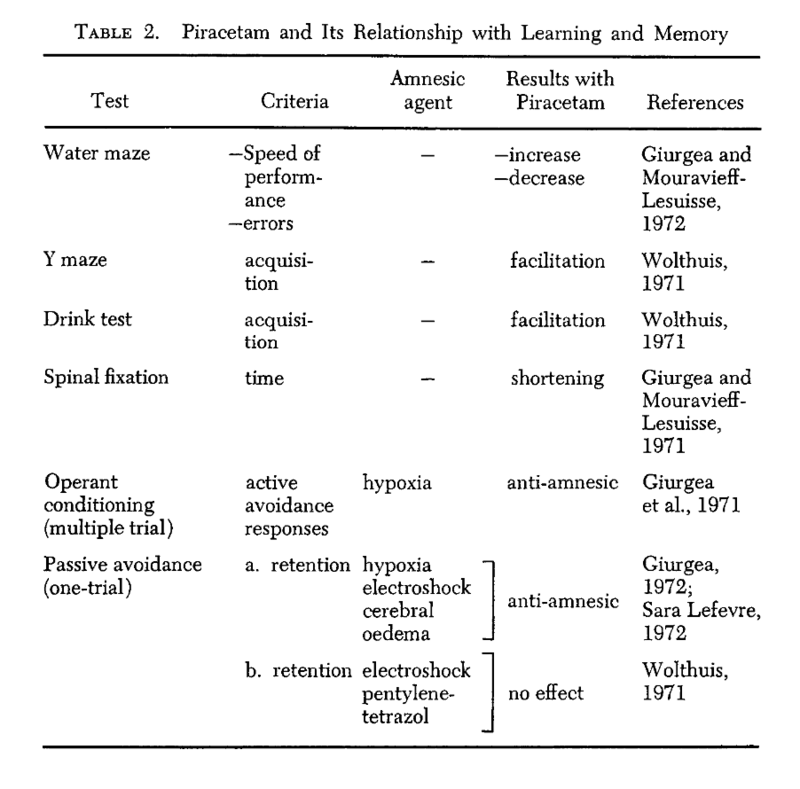 ); autonomic tests (no changes of the cardiovascular, respiratory, gastrointestinal systems) (Giurgea et al., 1967). 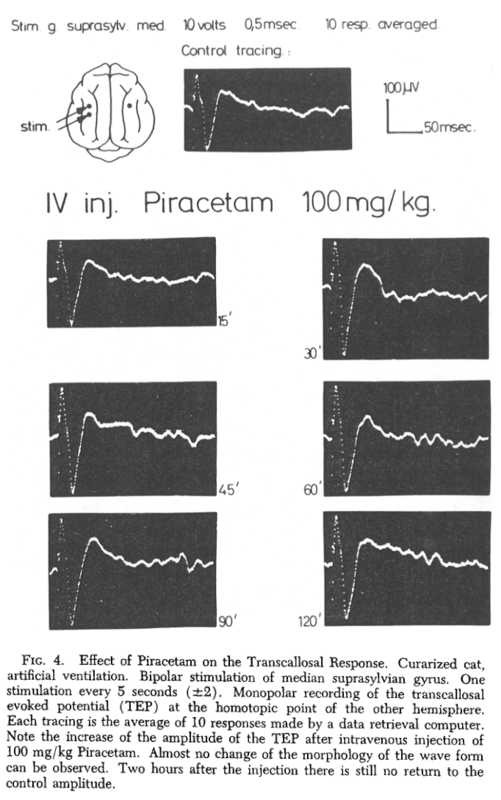 In contrast with the above inactivities, Piracetam at mg/kg was shown in rabbits to facilitate recovery of a normal EEG after severe brain hypoxia. The detailed method described elsewhere (Giurgea et al., 1970) essentially consists in submitting animals to a progressive lowering of the oxygen content of the air by nitrogen perfusion in a closed chamber. Two main parameters were followed: a. the delay between the onset of the N2 perfusion and the appearance of an isoelectric EEG tracing (“brain resistance”) and b. the delay between readmission of normal air and the recovery of a normal EEG (brain recovery). 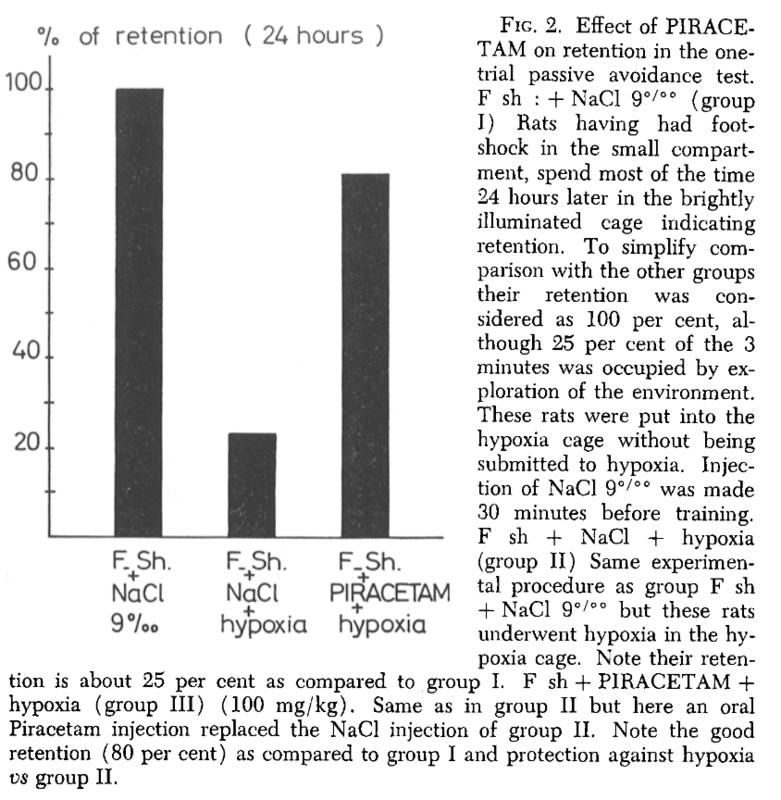 Table 1 shows Piracetam to enhance significantly brain-resistance and even more brain-recovery.It is to be recalled that, in the CNS, higher nervous structures are the most sensitive ones to lack of oxygen (Sugar and Gerard, 1938) and it will be seen below that Piracetam protects against hypoxia in other experimental situations as well. Table 2 gives a list, by now incomplete, of statistically— significant, repeatedly-done experiments with Piracetam in relation with learning and memory (with the references to previous papers). Attention will be drawn here only to experiments with rats dealing with so-called retrograde amnesia in one-trial, passive-avoidance learning procedure. Figure 1 shows the principle of the experimental procedure. These data are given here in more detail since they are apparently controversial to those of Wolthuis (1971). 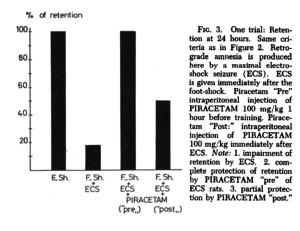 Indeed, while generally supporting our findings with Piracetam on learning facilitation, Wolthuis reports negative results in a one-trial passive-avoidance procedure, that were true even if Piracetam was given in pre-trial injections. The controversy might simply be due to experimental procedures which were different in the two laboratories. Therefore the generality of both Wolthuis negative and our positive results is somehow limited by the experimental model itself.As seen in Figures 2 and 3, pre-trial injections of Piracetam, but also to some extent post-trial injection, efficiently prevented “amnesia” produced in rats by post-trial application of electro-convulsive seizures (ECS) or hypoxia. Fig. 1. One trial learning: (A.) Principle; (Bures and Buresova, 1968). The cage consists of a small dark compartment and a large brightly illuminated one. Exploration; A rat prefers to stay most of the allowed time(3 min) in the small cage. Acquisition: A painful unescapable foot-shock is given to the animal in the dark closed compartment. Retention: 24 hr later when placed into the cage, only a very small percentage of the 3 minutes is spent in the dark compartment. (B.) 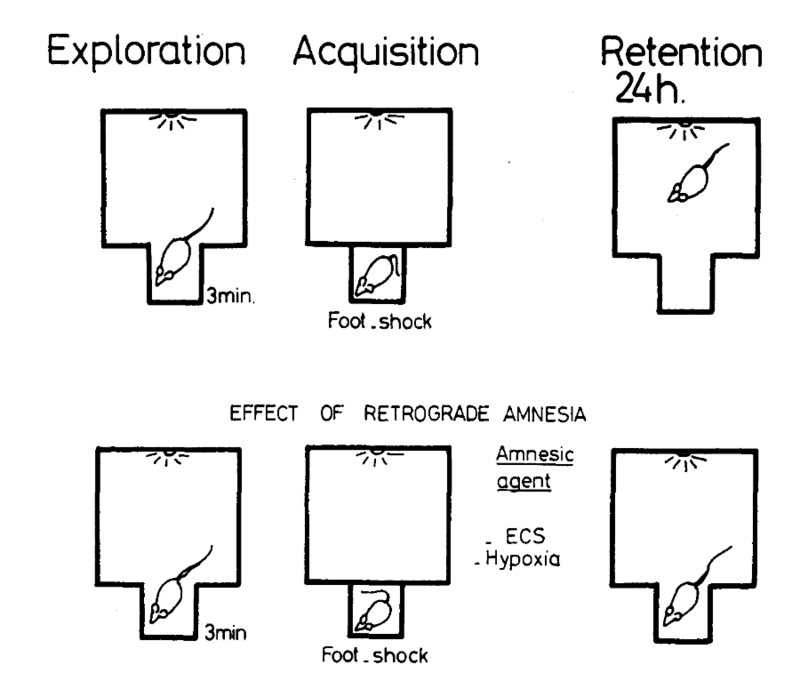 Effect of retrograde amnesia: When producing retrograde amnesia by hypoxia or electroconvulsive shock immediately after the foot-shock, retention is decreased very significantly and the rat returns to the dark cage 24 hours later. To summarize the above presented data. Piracetam is a compound which has no overt behavioral, autonomic or EEG (cortical-subcortical) activities up to dosages such as g/kg and yet it is able to protect against severe brain hypoxia and to enhance learning and memory in several experimental models at mg/kg dose levels. Piracetam is therefore a CNS-active drug, but the questions are: at which level (where?) and how? Evoked potentials (EPS) studies in cats showed that out of several cortical responses we have investigated, only the transcallosal response was enhanced by the compound. It should be noted that this is an event that takes place in a cortical associative area. Fig. 4 illustrates this effect on EPS (Giurgea & Moyersoons, 1972). Bures and Buresova (personal communication) obtained an interesting behavioral confirmation of our electrophysiological findings. They have used their elegant model of learning with monocular input and cortical spreading depression (CSD). The authors have shown that Piracetam significantly enhances the “writ-ing-in” callosal interhemispheric transfer of information. (Giurgea, 1972). Consequently, as an answer to the question “where,” we propose Piracetam as a compound selectively acting a telencephalic level and this for three main reasons: 1. it interferes positively with learning and memory and speeds up cortical EEG-recovery after severe brain hypoxia; 2. it does not interfere with the activities of peripheral as well as reticular, limbic or thalamic structures we have investigated; 3. it selectively facilitates one of the main mechanisms the callosal transmission that contributes to the harmonious, functional synchronization of the two brain hemispheres. The second question, how does it act? is even more difficult to answer but at least we know that it enhances the ATP/ADP ratio in the brain and so promotes energy reserves (Pede et al., 1971). Other data are available (Gobert, 1972) but they will be left aside: nor shall the abundant clinical favorable results obtained in pediatrics, geriatrics, toxicomania, etc. be taken into account (Sivadon, 1971). The last point is how to classify such a drug, whose activity could be summarized as follows: a. direct activation of the higher integrative mechanisms, b. telencephalic selectivity, c. particular efficiency to restore deficient higher nervous activity. Obviously such a drug does not fit into any described class of psychotropic drugs. A new class is therefore to be considered for which we propose the term Nootropic (from Noos—mind, and tropein—towards). of the brain. It is to be reminded that, phylogenetically, this integrative activity is probably the main factor in the evolution towards“Homo sapiens” (Penfield, 1966). Bures, J., and Buresova, O.: Applications recentes de la depression envahis-sante corticale (cortical spreading depression) a l’etude du comporte-ment. 161-178. In A. M. Monnier, Ed., Actualites Neurophysiologiques, Paris, Masson and Cie, 1968, pp. 347. Giurgea, C., Moyersoons, F., and Evraerd, A. C.: A GABA related hypothesis on the mechanism of action of the antimotion sickness drugs. Arch. Int. Pharmacodyn. Ther. 166:238-251, 1967. Giurgea, C., Mouravieif-Lesuisse, F., and Leemans, R.: Correlations electro-pharmacologiques au cours de l’anoxie oxyprive chez le lapin en respiration libre ou artificielle. Rev. Neurol. (Paris), 122:484-486, 1970. Giurgea, C., Lefevre, D., Lescrenier, C., and David-Remacle, M.: Pharmacological Protection against Hypoxia induced Amnesia in rats. Psychophar-macologia (Berlin), 20:160-168, 1971. Giurgea, C., and Mouravieff-Lesuisse, F.: Pharmacological studies on an Elementary Model of Learning. The fixation of an experience at spinal level: Part I, Pharmacological Reactivity of the Spinal Cord fixation time. Arch. Int. Pharmacodyn. Ther., 191:279-291, 1971. 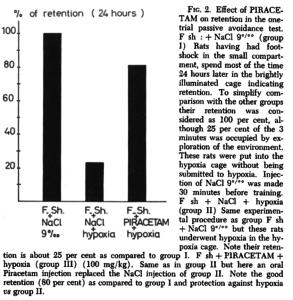 Giurgea, C., and Mouravieff-Lesuisse, F.: Effet facilitateur du Piracetam sur un apprentissage repetitif chez le rat. J. Pharmacol. 3:17-30, 1972. Giurgea, C., and Moyersoons, F.: In the pharmacology of cortical evoked potentials. Arch. Int. Pharmacodyn. Ther., 199:67-78, 1972. Giurgea, C.: Vers une pharmacologie de 1’activite integrative de cerveau. Tentative du concept Nootrope en psychopharmacologie. Actual. Pharmacol. (Paris), In Press, 1972. Gobert, J. G.: Genese d’un medicament: le Piracetam metabolisation et recherche biochimique. J. Pharm. Belg. 27:281-304, 1972. 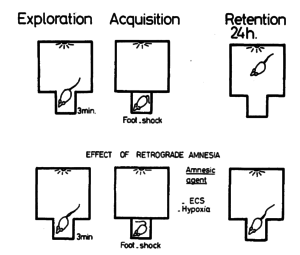 John, E. R.: Mechanisms of Memory, New York-London, Academic Press, 1967, p. 468. Konorski, J.: Integrative activity of the brain. Chicago and London, The University of Chicago Press, 1967, p. 530. 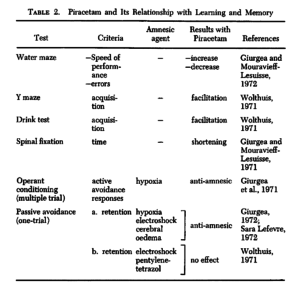 McGaugh, J. L., and Petrinovitch, L. F.: Effects of drugs on learning and memory. Intern. Rev. Neurobiol. 8:139-196, 1965. Pede, J. P., Schimpfessel, L., and Crokaert, R.: The action of Piracetam on the oxidative phosphorylation. Arch. Int. Phys. Biochem., 79:1036, 1971. Penfield, W.: Speech, perception and the uncommitted cortex. In Brain and Conscious Experience. Springer Berlin Heidelberg, N. Y. 1966; p. 591. Sara, S., and Lefevre, D.: Hypoxia induced amnesia in one-trial learning and pharmacological protection by Piracetam. Psychopharmacologia (Berlin), 25:32-40, 1972. Sivadon, P.: Le Piracetam: medication originale at particulierement interes-sante dans les toxicomanies. 5eme Congres de Psychiatrie. Mexique, 1971. Sugar, O., and Gerard, R. W.: Anoxia and Brain Potentials. ). Neurophysiol., 1:558-572, 1938. Wolthuis, O. L.: Experiments with UCB 6215, a drug which enhances acquisition in rats: its effects compared with those of metamphetamine. Eur. J. Pharmacol. 16:283-297, 1971.